Emerging Leaders recently published the results of a survey suggesesting that a lot of Londoners in the 20-44 age range think they may choose to leave the city over the next 10 years. Of the 280 respondents—most of whom were in the 20-44 age group—21% said they were not likely to remain in London for the next 10 years and only 43% said they were very likely to stay put (the rest said they were "somewhat likely" to remain). That's not a comforting number—and Emerging Leaders will be spending the summer developing some options for retaining the 20-44 year old workforce. London actually starts from a great advantage when it comes to youth—most communities would love to have the same concentration of well-educated people in their 20s that London has. Among the communities I've been looking at in Southwestern/Southern Ontario, only the City of Waterloo had a higher percentage of people in their 20s (see "Education and age differences across Southwestern Ontario and implications for "innovation" support," May 22), and the 2011 census shows London running neck-and-neck with Kitchener behind only Waterloo in its concentration of 20-somethings (see "Waterloo—not as young as it used to be (unlike the rest of us)," July 5). And, while Waterloo's population of people in their 20s shrank by 2% between 2006 and 2011, London's grew by 5%. The challenge seems to be what happens after that. One of the themes of the Emerging Leaders survey was "the difficulty of moving beyond entry level and mid level management positions into more senior roles" and the census numbers are consistent with that. While London scores highly in its concentration of 20-somethings, it falls slightly below the provincial average in people in their 30s and well below average in the 40-44 age range. 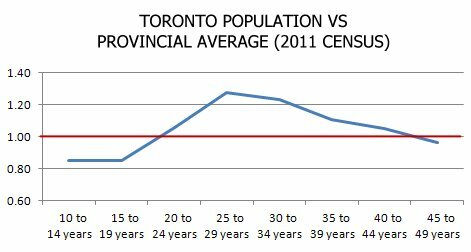 Compared to the provincial average, you can see that London scores very well with people in their 20s, but then starts to drop off once you get to 30-somethings. In contrast, Toronto shows an above average concentration well into the 40s (Kitchener is surprisingly similar to Toronto in its distribution). As difficult as keeping younger talent may be for London, there are many other places facing even bigger challenges. 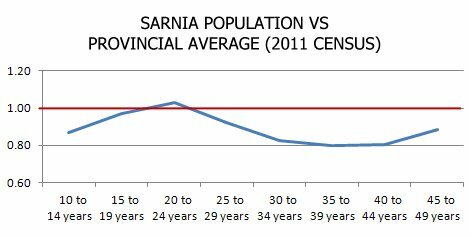 Lambton College helps Sarnia keep a slightly above average concentration in the 20-24 year range, but it drops quickly after that (the good news for Sarnia from the 2011 census it the high population growth rates it showed in the 20-34 range). 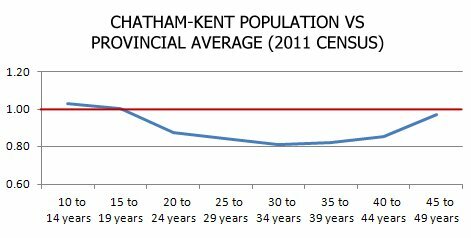 Chatham-Kent's age concentration line is similar to that for other less urban areas with no main campus university or college. So London does have challenges that need to be addressed, but many places would love to have the problem of having to figure out how to keep an overabundance of 20-somethings in their communities.